The third in the series of Agatha Christie PC games, Evil Under the Sun, again features that indomitable Belgian detective, Hercule Poirot. This time, Poirot is joined by his old pal, Captain Hastings. Evil Under the Sun, a third-person point and click adventure game, functions very smoothly, has acceptably realistic graphics, a professional soundtrack and excellent voice acting (even without David Suchet as Poirot). The game has more characters and locations, greater technical sophistication, a better inventory system, more meaningful dialogue choices and more face-time with Poirot than the first two games in the series, Murder on the Orient Express and And Then There Were None. But that doesn’t mean it’s perfect. On the eve of World War II, Poirot and Hastings sit in Poirot’s flat waiting out a blackout. To amuse themselves and to test Hastings’ “little grey cells,” Poirot describes to Hastings all the relevant facts of a murder Poirot has already solved—the strangulation of a beautiful actress at an English island resort where Poirot happened to be a guest. Hastings then steps into Poirot’s shoes to see if Hastings can solve the murder himself. 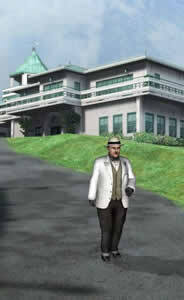 The play of the game is for you, as Hastings, to direct Poirot’s activities on the island. So in essence the player is directing Poirot’s actions. Yet at the same time, Poirot is in the background reprimanding Hastings when needed. This device is somewhat convoluted, but it does enable Poirot to be the main character in the game. In the long gameplay before the murder, you direct Poirot to explore the hotel, Seadrift Island and the nearby village of Leathercombe Bay. Also, Poirot must meet and do small favors for the twenty guests and staff members, such as finding lost mail and building a duck blind. To complete the favors, you must use and combine the inventory pieces you have picked up. Other diversions are smaller mysteries that could later impact the murder. At predetermined points the scene automatically shifts back to Poirot’s flat for re-caps and advice. For hints, you can return at any time to Poirot’s flat and use his hokey “finger of suspicion” device. A journal supplies additional hints and helps you keep track of tasks to be accomplished. Documents and maps are also available. Though based on the famous Agatha Christie novel of the same name, the ending of the Evil Under the Sun game has been altered to keep it surprising. The setting and style of the game and its dialogue are spot on—vintage Christie. The ongoing banter between Poirot and Hastings rings true and is generally amusing, although occasionally annoying. But too great a proportion of the game is spent before the murder to keep the dénouement as interesting as possible. Poirot wastes a lot of time wandering around the island and rifling though guestrooms instead of using his deductive powers. Plus, Poirot’s conversations are generally interviews with one character at a time. Not only is this stilted, but it is also tedious. Compare this to that classic, but now out of print, game The Last Express, (Broderbund Software, Inc. / Havas Interactive, 1997) in which more natural conversations occur between groups of characters. Agatha Christie’s books have ingenious plots, interesting characters, and exciting surprise endings. In Evil Under the Sun, because the murder victim is named at the start, some of the mystery is already gone. The main mystery is also diluted by the tasks, the smaller mystery diversions and the long pre-murder phase of the game. Perhaps it’s just that Evil Under the Sun is designed to accommodate the younger less experienced gamer. Though Evil Under the Sun does a fine job of capturing Poirot’s personality and the pre-war English seaside locale and it is more robust than the first two games in the series, it occasionally plods and minces along like Poirot out for a morning stroll.